Physics is one of the oldest natural sciences, intersecting areas of mathematics, technology and even philosophy. The study of phys­ics not only seeks to unlock the underlying laws of the universe, but also leads to breakthroughs with real-world application. A vast discipline with loose boundaries encompassing a number of fields and subfields, physics is a critical piece of the interdisci­plinary solutions necessary to tackle the major problems of today. In the Department of Physics at Ohio State, our faculty and students explore a number of dynamic subfields including Astrophysics; Atomic, Molecular and Optical Experiment and Theory; Biophysics; Condensed Matter Experiment and Theory; High Energy Experiment and Theory; Nuclear Experiment and Theory; and Physics Education. Visit the Physics Advising website. Undergraduate physics and engineering physics majors are strongly encouraged to participate in undergraduate research and internships to strengthen their resumes and help them determine what they’d like to do after graduation. During sophomore year, students are required to complete a physics seminar course to explore research and internship options. In this class, students hear from physics advisors, upperclassmen and alumni who provide them with all their options and encourage them to start thinking about post-graduation opportunities such as full-time employment or graduate school. On average, 75 percent of our students participate in at least one internship or undergraduate research experience prior to graduation. For more information visit the Department of Physics website or view the university's major curriculum sheet. Have a question about Physics or want more information? Let us know. 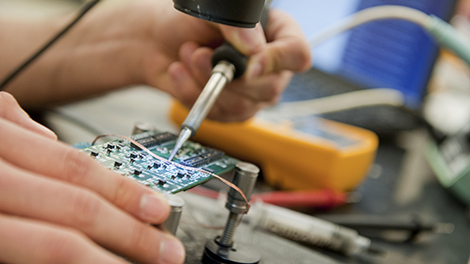 A degree in physics gives you a broad range of skills to pursue a wide variety of careers. It is particularly good preparation for work in any technical area, but many students use their critical reasoning skills to explore such diverse areas as business or law. All physics and engineering physics students take the same core physics courses. Courses beyond the core are tailored to individual programs. Recent Ohio State graduates have chosen many different careers, including physics, engineering, financial analysis, law, medicine, secondary education and more. Others choose to pursue a PhD in physics, which gives them top consideration for research and college-level teaching positions. Incoming physics majors are encouraged to take Physics 1250H during their first term at Ohio State. This course is an in depth study of classical mechanics including Newton's laws, conservation laws, and introduction to special relativity. Students are encouraged to speak to a physics advisor if they'd like to discuss their eligibility for this course. The Department of Physics offers both honors and traditional versions of Quantum Mechanics. The Honors Quantum Mechanics course is a rigorous course recommended for students who are intending graduate study in physics and who have a strong interest in quantum mechanics. This is a yearlong sequence. The Honors Electricity & Magnetism course is a rigorous course recommended for students who are intending graduate study in physics and who have a strong interest in E&M. This is a year long sequence. During their senior year, students in the program will take an Advanced Physics Laboratory course in which they will choose three classical experiments to carry out. These experiments include the Milikin oil drop, muon lifetime, double-slit, and more. Emphasis is on experimental techniques, analysis of collected data, and formal presentation of experimental results. The purpose of the Society of Physics Students (SPS) is to promote the development of physics students through interactions with fellow students, faculty and visiting physicists. Meetings are held every other week in the Undergraduate Physics Student Lounge (1011 Smith Labs) and consist of talks from both faculty and outside speakers on diverse topics in physics, along with lab tours. Sigma Pi Sigma exists to honor outstanding scholarship in physics, to encourage interest in physics among all students, to promote an attitude of service of its members toward their fellow students, colleagues and the public, and to provide a fellowship of persons who have excelled in physics. The main activities of the society involve outreach projects to enhance the teaching of science in Ohio middle schools and high schools. Contact gupta.208@osu.edu for more information. The Society of Women in Physics was created to encourage female students to become interested in the fields of science, engineering and technology and to network with students and faculty in those fields. Activities of the Society of Women in Physics include arranging for physicists to visit campus to talk about their research and accomplishments and outreach projects, such as mentoring and helping with GRASP and ASPIRE Summer Camps. The Undergraduate High Energy Physics Journal Club provides a forum for undergraduates to become more familiar with the techniques, theory, and issues in current high energy physics research. Every month, one member of the club presents on a relevant paper in high energy physics - the paper is provided for all members to read in advance. Email hill.1369@osu.edu for more information. These Physics Summer Undergraduate Research Scholarship supports undergraduate students pursuing research projects with an approved physics faculty sponsor during the summer. Each scholarship will provide a wage package in compensation for research work performed under the supervision of a supporting Ohio State Physics faculty member.